Chavannes – Considered to be the novice course in Les Gets, this track is great for acclimatising yourself with alpine downhill riding. It starts off as smooth fast turns leading into a tight bermed switchback section, before taking you into the open across drifty off-camber corners. Great fun! Tallywhacker – An unofficial track built by the Australian DH Team. This track is just what you would expect from world class riders. Really steep in places, very tight, with lots of drifty corners, this track will hone your downhill skills. Difficult in the dry, almost impossible in the wet, give this one a try but listen out for an Aussie ‘on yer left mate’. Gully/Canyon – Fast, rocky, and technical are three words to describe this course. It is rarely dry and always slippery but so much fun. There are a few unofficial variations of this course so be sure to spend a day exploring. Les Gets 2 (Mont Chery) – This was once part of the old World Cup track that started from the summit of Mont Chery, but the top section was sadly demolished in 2005. The bottom section is still fun to ride and in places is very fast and rooty. The final bermed field section is super steep and rough so make sure your brakes are up to the job! Mont Chery Freeride – A steep singletrack through the trees, this track is great fun to ride with your friends. Laugh out loud as you slide out of control down steep slopes into catch berms and try to avoid a pile up! Lots of fun in the dry, suicidal in the wet, Mont Chery Freeride will always put a smile on your face. Avalanche Cup Course – This course is very fast and extremely rough. It is sure to give your arms, wrists, and bike a good pounding. From the infamous ‘ten percenter’ to the tunnel, this track is action packed and will definitely keep you on your toes. Super Morzine – Very long and difficult. Usually wet and slippery, it will put your brakes and fitness to the test. There are always new sections and drops being built in the trees next to this track, so keep your eyes peeled. It may be worth stopping and checking them out. Les Crosets, Swiss National Track – This is not one for sufferers of vertigo. Extremely steep, rocky, and difficult. Overshoot a berm and the only thing between you and a 300ft drop is a piece of catch netting! Don’t let this put you off though, it is very much rideable, but take care! Chatel – This is a track for everybody. It is fast in places with lots of jumps of different sizes to suit most riding abilities. Chatel is so much fun you won’t want to leave, but keep your eye on the time as it’s a long ride home if you miss the last lift! 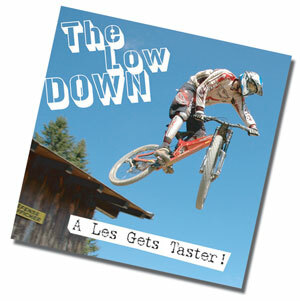 The Low Down, A Les Gets Taster! DVD featuring some of the downhill trails at Les Gets, with comments and interviews from the Ride-on and Le Boomerang staff. available from Ride-on. Contact us for more info.